Want to get away, but you’re pressed for time and tight on cash? 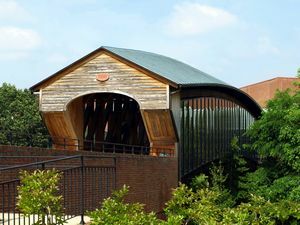 Try this great little North Carolina road trip that can be done in two days or extended for any length of time. Along the way, you'll visit some of the Heartland’s prime cities and drive through beautiful countryside in the NC Piedmont. The best part is that it’s an easy loop on a handful of routes with very little highway, covering approximately 350 miles, depending on where you decide to detour. Even better, it can be tailored to suit your budget. I began the loop in Durham, however, it can start in any town along the route and can be done in either direction. From Durham, heading south, there are two options. The first is to follow US-70 South into Raleigh to explore the state's capital, from there continue with the trip by heading south on US-1. Or, take US-15/501 South through Chapel Hill and Pittsboro. Since I recently spent some time touring Raleigh, I opted for the latter, stopping at points of interest along the way like the University of North Carolina (UNC) campus, Moorehead Planetarium, and the Botanical Gardens in Chapel Hill, then on to see the courthouse and shops along the center of Pittsboro. Route 15/501 South meets with US-1 just before Sanford. Follow US-1 South through the lovely Southern Pines area, where golf buffs may want to detour over to the famous course in Pinehurst, just west of Southern Pines. Pinehurst will be the site for the 2014 US Open. The loop continues south along US-1 past Rockingham Speedway, affectionately known as “The Rock”, and brings you into the city of Rockingham where US-220 North will begin the second leg of the trip if you started it from the east. Depending on time, this may be a good place to stop for the night as the scenic route north from here is best done during the day. US-220 North is rich with farmland and features farm stands offering fresh fruits, vegetables, and homemade goods. 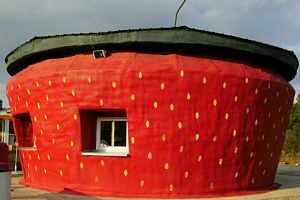 I stopped at The Berry Patch, a/k/a World’s Largest Strawberry, a farm stand owned by the Berry family that has an ice cream shop in the shape of a giant strawberry and features super-delish homemade ice cream made from ingredients grown on the farm. Once you've sated your palate with goodies from your farm stand stop, continue north on US-220 to the second Candor exit and drive a short distance east, in the direction of Whispering Pines, to the start of Route 705, also known as Pottery Highway. This winding NC Scenic Byway takes you through a central part of North Carolina’s pottery region and ends up in Seagrove. Stop at some of the potter’s studios along the way and visit the North Carolina Pottery Center while you’re there. 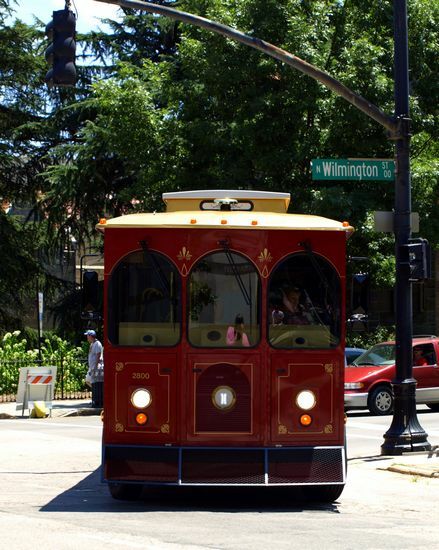 Pick up Route 220 North again in Seagrove, and follow the signs for Winston-Salem, the fifth largest city in the state. Be sure to spend time in the Old Salem Historic District, a National Historic Landmark, and see the museums and gardens there. Don't leave without a stop at Ollie's Bakery in the historic district on South Marshall and C Winkler Moravian Bakery in Old Salem. Trust me on this. layout, or design, all are connected by narrow passageways with some ceilings set as low as six feet. The first private little theater in America is located on the top floor of this eccentric house. From Kernersville, hop on I-40/US-421 South and drive the short distance to Greensboro, the state’s third largest city in population and the site of the historic 1960 Woolworth’s civil rights sit-in started by four African American college students who refused to leave their seats at the Woolworth’s lunch counter after they were refused service. A section of the original lunch counter is in the Smithsonian, and the site is now the home of the International Civil Rights Center and Museum. Make a stop to see the lovely historic district where the building is located. Pick up US-70 in Greensboro for the last leg of the trip that will take you through Burlington with its factory outlets for clothing and goods, and then continue on US-70 to Hillsborough, a historic town that was around long before Raleigh and Durham and has a rich Native American history. Hillsborough is now home to many artisans who sell their wares in the local shops. Antique hunters will love the Shops at Daniel Boone and historians will enjoy reading the many historical markers that line the streets, as well as information they will find in the Orange County Visitors’ Center, located in a llate-18th century Quaker-plan house. US-70 brings you full-circle into Durham. Those beginning the trip elsewhere can explore the City of Medicine before moving on. Don't worry if you can't get to see everything during your first time round, take notes and when the mood strikes, do it all over again.